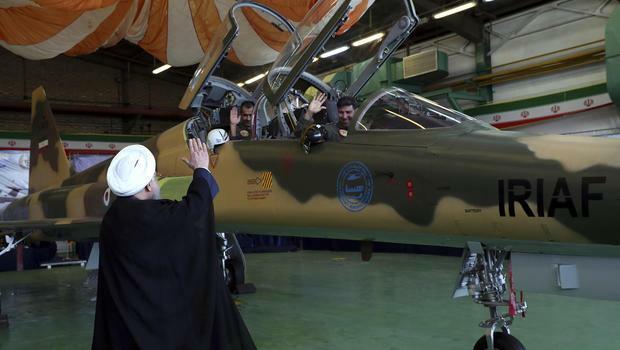 Amidst a tightening economic noose and now nearly weekly war of words with the Trump administration, Iran has just rolled out with its first 100% domestically-produced fighter jet. Iranian state television aired footage of President Hassan Rouhani sitting in the 'Kowsar' fighter aircraft, according to Tasnim News Agency, in an unveiling ceremony held after the jet completed a successful test flight in Tehran on Tuesday, which is National Defense Industry Day in the country. Nearly all of Iran's weaponry has been produced in country due to a history of international sanctions against it, which especially have targeted defense related materials. 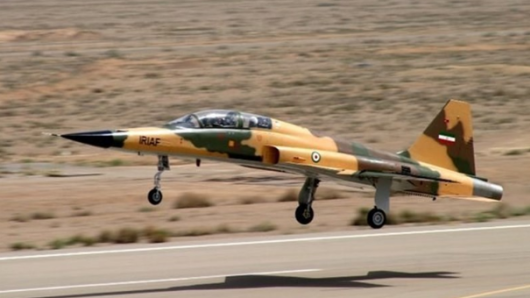 Iranian state sources claim the domestically produced aircraft is capable of flying at an altitude of 45,000 feet and at a speed of Mach 1.2 — just over the speed of sound, thought these claims couldn't be independently verified. In its current air force arsenal, Iran possess the U.S.-made F-4, F-5 as well as F-14 Tomcats, and further the Russian-made Sukhoi aircraft in service. Most of the American jets were obtained by Iran during the years of the Western-backed Shah, who brokered a wide-ranging deal with then President Richard Nixon and his national security advisor Henry Kissinger. As Al Masdar News reports the jet, which was first unveiled back in 2017 at the MAKS international air show in Moscow, was developed by Iran’s Aviation Industries Organization. Its most notable features include indigenous avionics and a fire-control system, making Iran one of few countries to possess the know-how necessary to develop such systems. While the prototype currently has two seats, future variations will also come with one seat only and will serve both fighting and training purposes. Meanwhile, during the Kowsar jet's inaugural ceremony , Iranian President Rouhani said Iran's defense program is aimed fundamentally at "deterrence" against the United States and its allies. "The enemy should see how expensive an invasion of Iran would be," he said. "Why does not the U.S wage a military attack on us? Because of our power." "We should make ourselves ready to fight against the military powers who want to take over our territory and our resources," the Iranian president said further. The aircraft's name, Kowsar, is a Koranic reference to a river in the Islamic concept of paradise, and also reflects the title of a chapter in the Muslim holy book.